Today marks the fiftieth anniversary of the Freedom Rides, a cornerstone civil rights campaign that desegregated public transportation throughout the United States. On May 4, 1961, seven African American and six white freedom riders left Washington, D.C. by Trailways and Greyhound bus services for New Orleans. Although the Supreme Court had already ruled in the 1960 decision Boynton v. Virginia that segregation in public transportation was illegal, the Interstate Commerce Commission (ICC) had not enforced the ruling. Nor had sufficient pressure been applied to the federal agency by the Kennedy administration; this was due largely to the fact that the base of the Democratic party was comprised of segregationist Southern Democrats, a bloc of voters that delivered Kennedy his narrow presidential victory. In order to be able to exercise their civil rights, African Americans still required federal intervention, due to obstructions posed by segregationist Southern authorities and violent white resistance. The Freedom Rides were thus organized by the Congress of Racial Equality (CORE), an interracial civil rights organization, whose founder James Farmer was inspired by the nonviolent activism of the Indian political and human rights leader Mahatma Gandhi. Through direct action activities, CORE sought to challenge segregation and eradicate Jim Crow laws and practices. After departing the nation’s capitol, the riders managed to travel through Virginia, North Carolina and Georgia in relative peace, though two Freedom Riders were attacked in Rock Hill, South Carolina (one of whom was John Lewis, who now represents Georgia’s Fifth District in Congress). Alabama’s resistance proved to be even more violent. The Greyhound bus was firebombed outside of Anniston while stopping to change a slashed tire; fortunately, the riders were not injured seriously. In Birmingham, however, passengers on the Trailways bus were attacked and beaten by angry whites. Matters were further complicated by the fact that bus drivers refused to drive Freedom Riders any further; the riders flew from Birmingham to New Orleans, so that they could finish their tour on schedule. After landing in New Orleans, several Freedom Riders regrouped in Nashville, where they were joined by Student Nonviolent Coordinating Committee (SNCC) members who were eager to participate. Together, they traveled by bus to Birmingham. During this attempt, they were met by segregationist police commissioner Eugene “Bull” Connor. Connor arrested three members of the group, and personally drove the remaining seven participants over the state border to Tennessee, where he then abandoned them on the side of the road. Once more, the riders made their way back to Birmingham, where they were again rejected by bus drivers who refused to carry them to Montgomery. At this point, the U.S. Justice Department under attorney general Robert F. Kennedy made arrangements with Alabama state authorities to protect the riders. An emissary from the justice department was assigned to travel with the riders, and bus travel to Birmingham resumed. However, the party was deserted by law enforcement protection while en route to Montgomery. While disembarking at the bus station, the riders were attacked with clubs and chains by an angry white mob, and the justice department emissary was knocked unconscious. In each Alabama incident, law enforcement was slow to respond, and it became evident that local officials had colluded with segregationist mob leaders. Pressured by increased media coverage of the violent response met by Freedom Riders, and enraged by the betrayal of Alabama state and local officials, Attorney General Kennedy obtained a federal court injunction that barred further assaults against the Freedom Riders, and ordered U.S. marshals into Montgomery. Kennedy also sought to convince the Freedom Riders to cease their travel; they refused, and twenty-seven Freedom Riders continued on to Jackson, Mississippi, where they were consequently arrested and incarcerated. On May 29, 1961, the Kennedy administration directed the ICC to enforce stricter desegregation policies in interstate travel. While the first twenty-seven Freedom Riders remained in prison, further waves of Freedom Riders continued to desegregate Southern public transportation facilities into the fall; hundreds of these riders were arrested. On November 1, 1961, the ICC ruled segregation in interstate travel illegal. Freedom Riders continued to test the efficacy of the ICC’s ruling by traveling in small groups throughout Southern states, some still met resistance. In December of 1961, a group of freedom riders traveling from Atlanta to Albany, Georgia were arrested while testing the recent ICC ruling. The response to these arrests gave way to the seminal Albany Movement. Ultimately, all facilities desegregated. (see clip above) Here, during a press conference in Montgomery, Alabama on May 23, 1961, Alabama governor John Patterson demands that “agitators” Martin Luther King, Jr. and the Freedom Riders leave Alabama immediately and condemns the Freedom Riders for seeking to cause racial unrest. 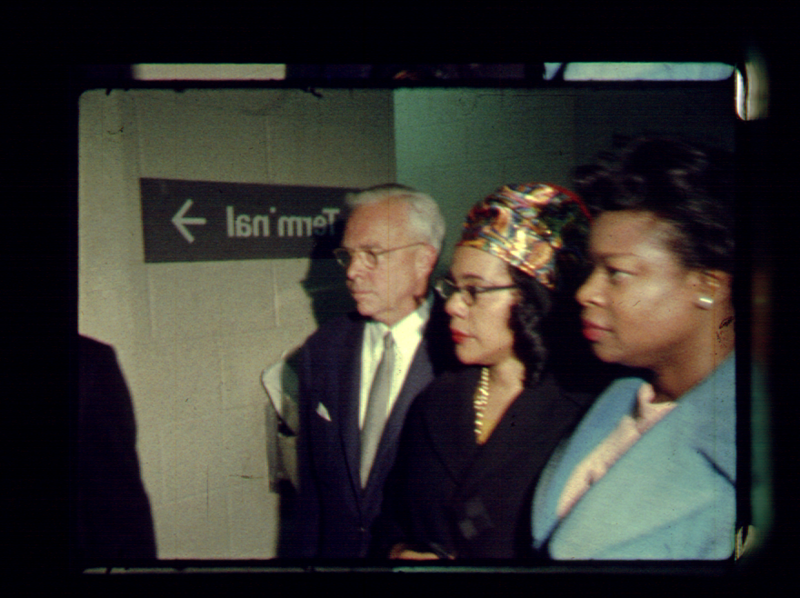 (see clip above) In this WSB newsfilm clip from May 24, 1961, Julia Aaron and Jean Thompson, two African American female freedom riders, are arrested by police as they disembark a Trailways bus in Jackson, Mississippi. (see clip above) This WSB newsfilm clip from May 14, 1961, includes footage of the destroyed Greyhound bus attacked in Anniston, Alabama Victims of the attack comment on the day’s events from the local hospital. (see clip above) This WSB newsfilm clip documents a mass meeting held in Montgomery on May 21, 1961 in Ralph David Abernathy‘s First Baptist Church, the day after the bus station attack. Martin Luther King, Jr. had flown in to speak to a crowd of the freedom riders and more than one thousand supporters where an angry white mob surrounded the building until nearly six the next morning. During this meeting, King encouraged the practice of nonviolence, and church hymns were sung. Alabama National Guard trucks and federal marshals secured by Attorney General Robert Kennedy eventually dispersed the crowd and escorted members of the assembly to their homes. The Civil Rights Digital Library also provides links to resource materials in archival collections across the country that include oral history interviews and transcripts of interviews with Freedom Riders (the transcript of an interview with U.S. Representative John Lewis conducted in 1973 is here; as well as FBI files regarding freedom riders; and mug shots of Freedom Riders arrested in Jackson, Mississippi. Visit http://crdl.usg.edu/events/freedom_rides/ for access to more resources on the Freedom Rides.